Did Mayor Bill de Blasio just announce (without announcing) that he’s running for President in 2020? If so, his next great move may be to add Hillary Clinton to the ticket as VP. 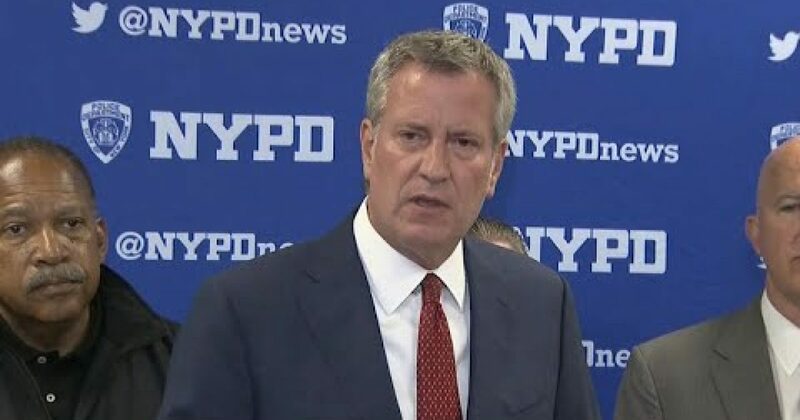 In a move that has backfired, de Blasio jetted off to Germany on Thursday with several staffers. An obvious boondoggle, de Blasio blazed a carbon-footprint violating trip to Deutschland under the guise of studying global climate change. You know things work with the Left. You’re inconspicuous by your absence. Global warming is the new fashion, and everybody who’s anybody must declare his allegiance. So what a police officer had been ambushed and killed only days earlier and the funeral pending. Oh, and that NYPD swearing-in ceremony could wait too. Thankfully, the taxpayer didn’t foot the entire bill. As it turns out, the G20 protest group, “Hamburg Shows Attitude,” picked up the cost of de Blasio’s trip. The carrot: Hamburg folks let de Blasio deliver the keynote address. Unbelievable. Instead of jet-setting around the world, he should be here doing his job . . . A police officer was murdered, street homelessness has skyrocketed and people continue to get delayed on the trains . . . The mayor should be embarrassed by the way he has treated the men and women of our police department. Of course de Blasio should have stuck around to honor his fallen officer and comfort the city. Officer Miosotis Familia was a mother of three. And because of leftists like de Blasio, an ex-con with a history of violence and mental illness slipped through the cracks and murdered her. Next, de Blasio should have attended the NYPD swearing-in ceremony for 524 badly-needed cops. Essentially, de Blasio let the farce of global climate change supersede the lives of New Yorkers. But you can believe that de Blasio and his leftist supporters will spin this. As we’ve learned from many leftists, global climate change is the biggest threat America (and the world) faces. So, de Blasio left New York City with excuse in hand. The man is delusional if he thinks he has a shot at president. But, Democrats fuel themselves on delusion.